Despite all the negative comments about its neither-a-phone-nor-tablet display size, the Galaxy Note is now among Samsung’s more successful products. According to official figures released in June, the company sold a cool 7 million units of the device seven months since its launch. 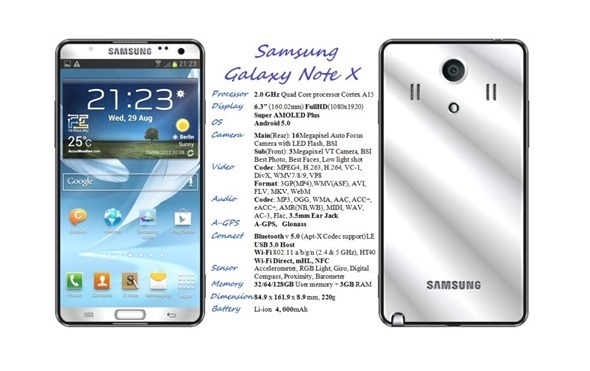 Samsung later announced the technically improved Galaxy S III-based Galaxy Note II. Now, while the next Galaxy Note announcement is months away, the folks over at Concept Phones have come up with an interesting mockup called the Galaxy Note X. Check it out after the jump. Put together by Erica Yusim, the Galaxy Note X – like most “concept” smartphones – comes with a specifications list from the future. They don’t appear realistic at all when compared to today’s smartphones, but things move really fast in the smartphone industry, so I expect such hardware in phones in two or more years. It features a quad-core Cortex A15-based chip running at 2.0GHz, 3GB of RAM, 32 / 64 / 128GB of built-in storage, a 16-megapixel camera complemented by a 3-megapixel camera on the front, a 4000mAh battery, USB 3.0 with hosting, Bluetooth 5.0, with Android 5.0 managing it all. As if the 5.5-inch display on the Galaxy Note II wasn’t enough, the display on this beast of a (concept) phone is a larger-than-life 6.3-inch (diagonally) with a full HD 1080p resolution. If Samsung does indeed decide to further increase the display size on the Note, they might as well change its name to Galaxy Tab 6.3. Considering how they recently announced the Galaxy Player 5.8, that doesn’t seem too far from reality. 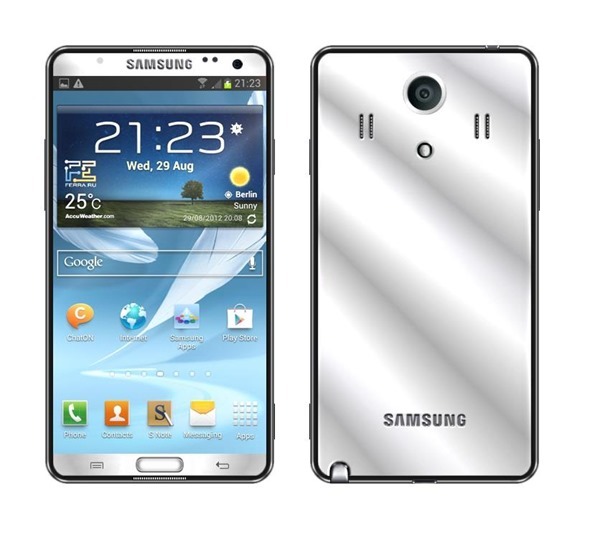 Speaking of reality, the Galaxy Note II is all set to release in the middle of October. It comes with a 5.5-inch HD display, 2GB of RAM, a quad-core chip clocked at 1.6GHz, 8 MP / 2 MP cameras, powered by Android 4.1 Jelly Bean. I certainly won’t be getting one since, besides being well settled with the iOS ecosystem, I don’t like the concept of really large phones that can’t be used comfortably with one hand. Larger displays do have their advantages – improved movie watching / game playing experience, easier text input – but they aren’t for me.